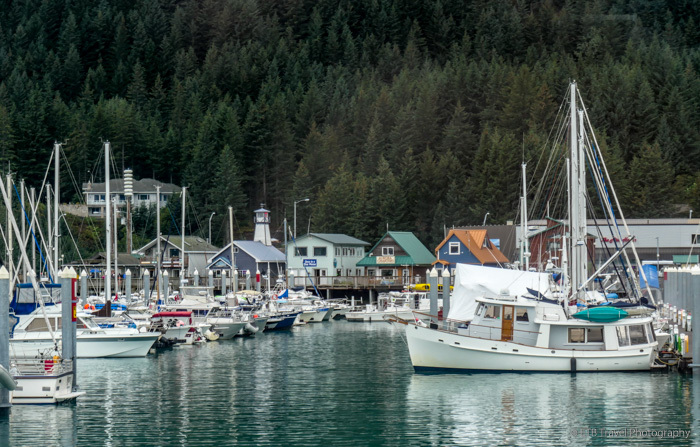 After our backpacking trip and time in Anchorage, Ross and I went to Cooper Landing for a day of fishing and then to Seward for a day of sight seeing. While very nice, if there were a next time, I’d just go straight to Homer as similar activities may be found in Homer including bear watching which makes for less moving around. Having said that, we took the scenic hour drive from Cooper Landing to Seward in the rain and entertained ourselves with a short hike and a six hour boat tour. Our short hike was to Exit Glacier which seemed to create its own weather pattern because it wasn’t raining. This was a welcome relief. The glacier is part of Kenai Fjords National Park. Many National parks have very well maintained and somewhat commercialized trails. Normally, I don’t like this type of trail, but after hiking in mud for most of the last eight days, I welcomed the partially paved path with interpretive signs! The Glacier Overlook Trail is only about two miles. The first portion of the trail is paved and marked with dates indicating where the Glacier used to be in the past. It has receded about one mile since 1815, though interestingly at a very accelerated rate between 1917 and 1926 and a very slow rate between 1926 and 1951. It was also interesting to see a full forest growing in its old place. We enjoyed the stroll and the nice view of the glacier before returning to the harbor in Seward to board one of Kenai Fjords Tour Boats. Before booking the tour, I asked if we would see anything due to the rainy weather and low clouds overhead. I was assured we would. While the captain was exceptional at maneuvering the boat close to many areas in order for us to get good views of certain wildlife, waterfalls, and the glacier, the low hanging clouds and fog obscured many of the harbor’s surrounding peaks. I should have trusted my instincts rather than listen to the tour salesman, though I’m not sure what else we would have done in Seward. We may as well have been dry on the boat than wet while walking the one main street in town. The boat ride is just a bit pricey for an overcast day which is most of the time in Alaska! The tour description fails to mention that at least two hours is spent crossing open water with potentially rough seas. Fortunately for me, I don’t get sea sick, but not all passengers were so lucky. For the other four hours, in the tour operator’s defense, we sailed on smooth waters and were able to see eagles, sea lions, otters, puffins, glaciers and even a bear that looked like a dot on the hillside as we explored the Kenai Fjords National Park, their most popular tour option. I found a few things on the tour very interesting. First, is the perspective of the surrounding land. When the boat neared the glacier, the captain announced we were still a quarter mile away. I couldn’t believe it. It looked so much closer to me. Another unique fact I had never given much thought to is snow flakes create the glacier. The glacier calves and melts in the ocean. The water is evaporated back into the sky and snow falls again, completing the cycle. It made the melting of glaciers seem like less of a disaster knowing more are being created. I guess that is why the ice is expanding in Antarctica (which we never hear about). Finally, one of the waterfalls, fed by three lakes, was huge at the top. At the bottom, however, almost none of the water was entering the ocean. It was all going into an underground spring. It was really fascinating watching the disappearing tumbling water. Previous Post Fishing in Alaska…NOT!